Jessica Habie is a seasoned documentarian, but for Mars At Sunrise, her film about the imprisonment of now-Paris-based Palestinian artist Hani Zurob, she’s chosen to depart from the binding strictures of fact. This much seems to be factual, or at least congruent with Zurob’s memory: While living in Ramallah, he was detained by Israeli authorities and ordered to name names of artists affiliated with Hamas and other like-minded groups. An interrogator who seemed particularly interested in Zurob made a peculiar request of the artist. When Zurob declined, the officer took personal, deliberate revenge by breaking Zurob’s hand. It’s this specific act of cruelty—an act of creative jealousy, in Habie’s re-imagining of the incident—that fuels Mars At Sunrise, her slender, surreal, ultimately frustrating feature debut. Running into his former captor again sends Khaled back into his memories of the affair, obscured by fear, trauma, and forced sleep deprivation. 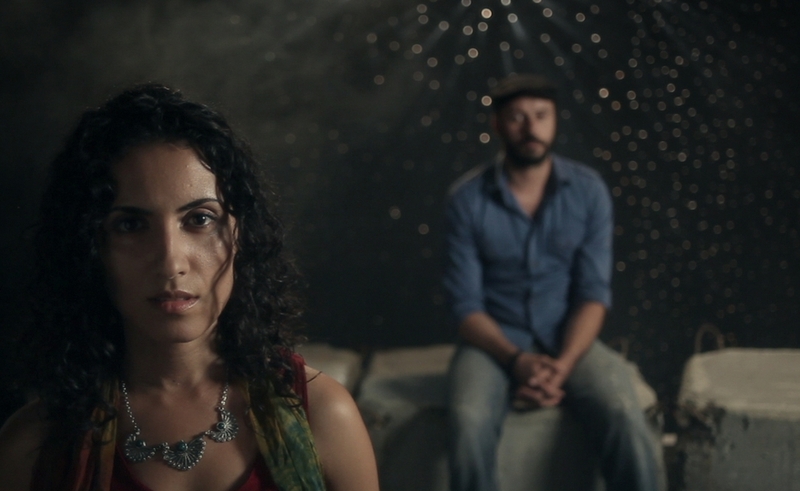 Azzadeh’s verse, read in voiceover (Haale Gafori, the Brooklyn-based actress/musician/poet who plays Azzadeh, wrote it) is a frequent element of Khaled’s harrowing but gorgeously photographed nightmares, even though the two have only just met. Sometimes these literally and figuratively poetic sequences recall the deft confluence of verse and image in Wim Wenders’ 1987 masterpiece Wings Of Desire, though cinematographer Xavier Cullineras makes his frames as sensuous and colorful as Wings Of Desire’s were chilly and monochromatic. Even when the marriage of words and pictures is less successful, these scenes have the arbitrary quality of dreams—and of early-1990s music videos like the ones Tarsem Singh (“Losing My Religion”) made before graduating to feature filmmaking. But the dream images and recollections aren’t all Khaled’s. His tormentor Eyal (Guy El Hanan) gets a psychological investigation, too. Most powerfully, he relives his accidental killing of a young boy during an afternoon gun battle against an unseen enemy. Eyal, who defaces the paintings in Khaled’s studio while arresting him, is worn down by the suspicious, intrusive work of being a policeman. When border-crossers bristle at his questions, he seems cowed, as though they’ve rejected him personally. The scrawny, sunken-eyed El Hanan (an Israeli radio personality and playwright) makes the soldier’s self-loathing palpable. But the inwardly crumbling fascist/censor/demagogue is as familiar a trope as the heroic artist who refuses to succumb to fear. Habie’s fractured narrative style—particularly her arbitrary shifts from Khaled’s perspective to Eyal’s to (apparently) third-person reality—stymies the accumulation of any dramatic momentum from scene to scene. Given the seemingly intractable nature of the conflict her film dramatizes in miniature, this unfinished quality may actually be deliberate. It’s still frustrating, though, that her credibly acted, gorgeously shot movie isn’t ultimately more persuasive. In the film’s press notes, Habie writes that she “needed a more subtle language” than documentary filmmaking to tell the story Zurob inspired. The language she’s using here isn’t subtle, though. It’s needlessly obtuse. And hearing her out requires more patience than it should in a film that’s this short.